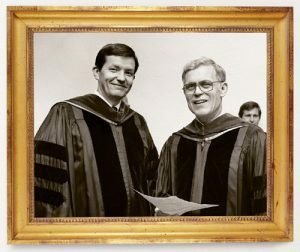 From lab coats to academic robes, from physicians' scrubs to dark suits, Cecil Samuelson has passed through various dress codes in his careers as physician, professor, scholar, administrator, and General Authority. As he takes a new mantle as the 12th occupant of BYU's presidential office, it appears all of his previous roles have combined to make the current one a perfect fit. When Cecil O. Samuelson was about 2 years old, he decided his nickname didn’t suit him. According to family members, he calmly told his mother to stop calling him “Sammy” and start using his proper name—Cecil. He’s been known as Cecil (or Cec) ever since. Cecil and Sharon Samuelson have made a life out of responding to invitations to serve. Through a career of successive administrative appointments and a personal life filled with demanding church callings, they have served together. As he comes to BYU, President Samuelson says Sharon is his greatest asset. Photography by Seth Smoot and Mark Philbrick. That self-confidence and decisiveness were early indicators of achievements to come—renown as a physician and professor of medicine, contributions to significant research in rheumatic diseases, and administrative proficiency in academic, business, and ecclesiastical settings. As the recently named 12th president of BYU, he will combine his strong sense of self with all he’s learned in his various roles. Longtime colleague and former University of Utah president Chase N. Peterson says President Samuelson is “a wonderful choice,” in particular because, as both a scholar and a member of the First Quorum of the Seventy of The Church of Jesus Christ of Latter-day Saints, he embodies the meld of faith and knowledge so central to BYU’s identity. “He understands faith, and he lives by it. He understands the intellect and the pursuit of new ideas called research. And he understands that there’s harmony between the two,” says Peterson, a fellow physician. As a young man, Cecil Samuelson thought medicine would be an ideal blend of his interests in science and people. As his career progressed, his generalist sensibilities led him to a wide range of activities. Photo courtesy Sharon G. Samuelson. President Samuelson began contemplating career possibilities during high school, not long after the Soviet Union launched Sputnik I, jump-starting the space race with the United States. Though he began his undergraduate education at the University of Utah as an engineering major, during his mission to Scotland he discovered he enjoyed working with people. He also liked science, however, and he decided medicine might offer an ideal blend of interests. Over the next eight years at the University of Utah, Samuelson completed his bachelor’s degree and attended medical school, graduating second in his class. In the middle of medical school, with an inkling he might want to follow in his father’s footsteps as a professor, he made the unusual move of adding to his course load by beginning work on a master’s degree in educational psychology. Samuelson then headed to Duke University Medical Center in Durham, N.C., for a three-year residency and fellowship in rheumatic and genetic diseases. During his last year there, he worked intensely in the laboratory purifying and sequencing an enzyme. The experience was illuminating. 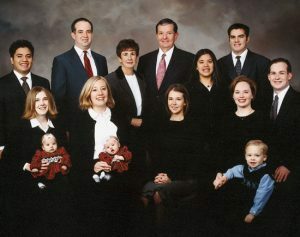 The Samuelson Children (with spouses and children) include oldest son Cecil III (fourth from left, with Linda holding Anna), a Salt Lake Real Estate Agent; Scott (far right, with Allison and James), an internal medicine resident at Duke University; Adoptedtwins from Guatemala – Benjamin (far left, with Jennifer holding Maya), a college student in Arizona, and Rebecca (fifth from right, with David Wilson), who works while her husband attends BYU; and Sara (sixth from right), a University of Utah student. Photo courtesy Scott C. Soderberg. Duke offered him a position to continue his research and teach, but the University of Utah also came up with an offer. While he and his wife, Sharon, thought they would eventually return to their roots in the West, they didn’t anticipate going back so soon. But the University of Utah job, assistant dean of admissions and faculty member at the medical school, appealed to Samuelson’s generalist and people sensibilities. So in this age of superspecialization, Cecil Samuelson became a generalist. Though he has an MD and is board certified in the subspecialty of rheumatology, he has consistently chosen to take on widely ranging projects and responsibilities. Once back in Salt Lake City in 1973, he proceeded to practice medicine, conduct research, and teach and administer in the secular and sacred spheres. Within four years of accepting the University of Utah position, he became acting dean of the medical school. He was also quickly called to service in a married student stake as a high councilor, branch president, counselor in the stake presidency, and then stake president. 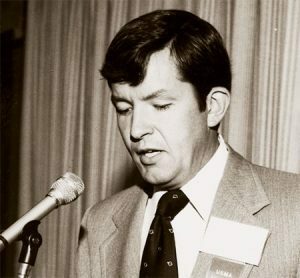 In January 1985 he became dean of the school of medicine, and three years later he was named the university’s vice president for health sciences. Also in the mid-1980s, he served as a Regional Representative for the Church. 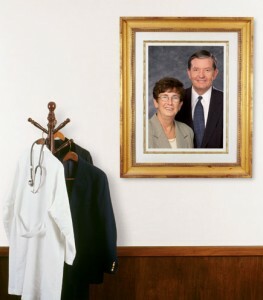 As Cecil Samuelson took on more and more responsibilities managing the U’s complicated, almost labyrinthine medical school, his reputation grew for intelligence, fair-mindedness, affability, and broad scope. Due to scarce funding, the medical school was dependent on the ingenuity of its faculty and administrators, says Peterson, who was vice president of health sciences when Samuelson served as medical school dean. “Cec and I used to chuckle about how we had a whole bunch of wild-eyed, independent people here all doing their own thing, but we also had to have some coherence—we couldn’t just be all flying out in different directions. But if we didn’t have this great entrepreneurial spirit, we’d be dead. The way to handle such an operation was to give creative people the freedom to actualize their vision while also holding them responsible. Samuelson, Peterson says, had a gift for helping everyone keep their equilibrium as they worked to balance these competing interests. As a young boy, Cecil Samuelson enjoyed baseball and fishing. He later learned to play the saxophone. Photo courtesy Sharon G. Samuelson. In 1990, after 17 years at the University of Utah, Samuelson was recruited away from academia to become a high-level administrator at Intermountain Health Care (IHC). “What this says of the man is that he’s a superb administrator—but more than that, that he has the confidence of his peers,” says Snow, who was in the University of Utah administration with Samuelson in the 1980s. After a few years as a senior vice president, Samuelson was named president of IHC Hospitals, and it appeared he was being groomed to be president of IHC itself. But in October 1994 he was called to full-time service as a member of the Seventy of the Church of Jesus Christ. He walked away from IHC without a backward glance. When asked at the time about his choice to leave his career just when he was approaching a pinnacle, he said he had decided years earlier that he would always respond to any calling extended to him in the Church. 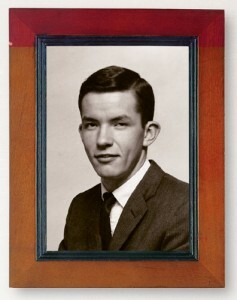 The oldest of five children, President Samuelson credits his parents, Cecil O. Samuelson and Janet Brazier Mitchell Samuelson, for his positive traits. He had a wonderful childhood, he says, with parents who taught him a strong work ethic, honesty, and devotion to church and family. The Samuelsons were an ordinary family with everyday struggles, such as the time they decided to drink powdered milk to save money for a television. “We didn’t come from a background of either abject poverty or great privilege but from very solid roots—loving parents who worked together,” says Samuelson. Dean Samuelson attends graduation at the University of Utah School o fMedicine with James O. Mason, who was a colleague at the medical school in the 1980s and in the Seventy in the 1990s. Samuelson’s greatest satisfaction at the University of Utah came from the people who were his students, patients, and colleagues. Photo courtesy Sharon G. Samuelson. His father was always building things—a couple of homes, a boat, a car. Cecil Sr. came from a family where no one had attended college, but he married into one where six of seven children were collegians. Janet persuaded her husband of the virtues of higher education, and at the age of 25 Cecil Sr. became a college freshman at the University of Utah. He was in his early 40s when he finished his doctorate in educational psychology and joined the university’s education faculty. 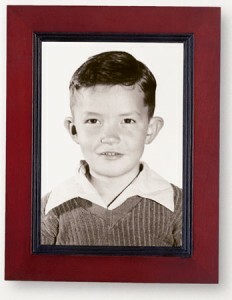 Thus began the multigenerational Samuelson ties to the University of Utah. Like his father, Samuelson has found himself comfortable with a hammer in his hand. Early in his career at the U, he spent his evenings for a few years building a Tudor-style home for his family on a dead-end street in the Holladay area of Salt Lake. He subbed out only a few tasks, having learned the trade with his father and while working to fund his education. These days, Samuelson has less time for hobbies or recreation but does enjoy crossword puzzles, solitary walks, athletic events, and time with his family. He met his wife, Sharon Giauque Samuelson, 40 years ago, and both joke that their marriage was arranged. Sharon was the elder Cecil’s secretary at the U, working her way through a history education degree. Her employer often told her about his son who was on a mission, and when Cecil Jr. returned, he regularly met his father at his office for the end-of-the-day ride home. “It took him about four months, and then he asked me out. Neither one of us dated anybody else after that,” says Sister Samuelson. Friends and family say Sister Samuelson is bright, independent, friendly, and straightforward. The oldest of five children, she grew up in Salt Lake City and attended Highland High School. After graduating from the University of Utah in 1964, she taught fifth and sixth grade until she gave birth to their first son, Cecil III. Part of what people get, says eldest son Cecil, is a woman whose husband has been gone much of the time, bringing out in her a quiet but determined independence. “I try to be supportive but still take time for myself because I think that’s really important,” says Sister Samuelson. She has been a member of a book club for nearly 30 years, attends the Utah Shakespearean Festival in Cedar City with friends, plays tennis, and is an avid fan of the Utah Jazz. Her greatest satisfactions continue to come from the Samuelsons’ five children and three grandchildren. Contributing to President Samuelson’s success is one of those rare constitutions that allows him to function on less sleep than most people and catnap as needed. With only a touch of gray skimming his forehead, he looks younger than his 61 years—thanks in part to a daily 45-minute regimen on a NordicTrack. Wherever he’s headed, he walks at a speed that approaches running. “He seems to have the same energy, enthusiasm, and optimism that he did 20 years ago,” says Anthony W. Morgan, a former U of U administrator and current U professor of educational leadership. Dr. Samuelson speaks as a delegate to the Utah State Medical Association at its annual meeting. He credits his parents for encouraging him and his siblings. “They had enough confidence in us, without being unrealistic, that we could achieve most of what we wanted to do – if we were willing to work hard enough.” Photo courtesy Sharon G. Samuelson. His efficiency is legendary, says close friend H. James Williams, a physician who was Samuelson’s partner in clinical practice for 16 years. When Samuelson became stake president, high council meetings lasted three or four hours, says Williams, who served as Samuelson’s counselor in the presidency. “He commented in a presidency meeting that if the Quorum of the Twelve can run the Church in an hour and a half, the stake can run on an hour-and-a-half meeting.” So Samuelson moved the meeting to 6:30 a.m. on Fridays, knowing that most council members would have other commitments by 8 a.m. “We lost nothing in the running of the stake,” says Williams. Kent Samuelson says his sibling’s latest position provides an opportunity for an ideal blend of his talents and abilities—a union of intellectual, administrative, spiritual, and ecclesiastical skills that was never quite possible in his assignments at the U or at IHC. 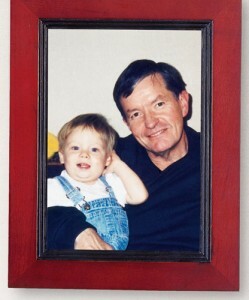 Grandpa Samuelson enjoys a moment with his oldest grandchild, James. Love and laughter are emphasized in the Samuelson home, says Sister Samuelson. “We joke a lot,” she says. “Our family likes to laugh.” Photo courtesy Sharon G. Samuelson. M. Sue Bergin is an adjunct faculty member in the BYU Honors Program and a writer and editor in American Fork, Utah. The day after Cecil O. Samuelson was named president of BYU, a friend delivered to Elder Samuelson’s office a round layer cake decorated with white frosting and Cougar-blue piping. On top were written the words Stay True to Your School, with the Y conspicuously fashioned to look just like the Cougar block Y. “He cut it open, and it was red!” says Sharon G. Samuelson, President Samuelson’s wife. The friend was Kristen McMain Oaks, wife of apostle Dallin H. Oaks, ’54. With degrees from both the University of Utah and BYU (a doctorate in 1988), Sister Oaks is familiar with the loyalty questions—and jokes—the Samuelsons face. Sister Samuelson, in particular, has been an easy target because of her lifelong passion for the Utes. “Ever since the announcement, anybody who knows Cec and Sharon has just laughed and thought, What is Sharon going to do? They’re waiting to see how she is going to look in blue,” says family friend Ellis Ivory. Sister Samuelson confirms that friends are finding the situation exceptional fodder for teasing. “We’ve been sent red and blue balloons. I’ve gotten red and blue flowers and red and blue cookies,” says Sister Samuelson. And she’s starting to hear the rumors floating around BYU, including one that says the bottom of the Samuelson’s swimming pool brandishes a huge red U. Just one problem: The Samuelsons don’t have a pool. Both President and Sister Samuelson want to put to rest any ideas that they can’t or won’t be fully devoted to BYU. “As my husband has said, you love your first child, but you love your second child just as much, and you don’t love the first any less,” says Sister Samuelson. Samuelson showed that loyalty immediately. Though it was a Saturday and only his third day on the job, President Samuelson caught a last-minute flight to Long Beach, Calif., to cheer on the BYU volleyball team as it competed for the national title. As for the rest of the family, youngest child Sara will continue her studies at the U, and oldest child Cecil III will stick by his red alma mater. His most pressing concern is not whether his parents will turn true-blue but whether they will hang on to their coveted U of U season tickets.